The SunTrust Travel Rewards Credit Card is a hybrid cash back and travel rewards credit card with an $89 annual fee and a rewards program that favors travel spending. Like competitors such as Chase Sapphire Preferred, which have comparable annual fees – it’s designed to reward frequent travelers with loyalty currency redeemable for cash, travel, experiences, and more. The SunTrust Travel Rewards Credit Card has a long sign-up bonus period: 12 months, during which travel purchases earn 5% cash back, up to $6,000 in total travel spending. The card’s 0% APR introductory promotional period is even longer at 15 months, during which purchases and balance transfers accrue zero interest. SunTrust deposit account holders are particularly well served by this card. SunTrust Signature Advantage, Premier, and Private Wealth Management clients all enjoy annual fee waivers, meaning they can use this card for free. And, depending on the type of account, account holders can earn bonuses of up to 75% on cash back redemptions – turning $100 into $175. Intrigued by SunTrust Travel Rewards Credit Card? Curious whether it’s a worthy alternative to better known travel credit cards? Read on to learn more about its features, advantages, disadvantages, and general suitability. When you spend at least $3,000 in qualifying purchases during the first 3 months your account is open, you’ll get a $250 statement credit. Once the sign-up bonus period ends or you accumulate $300 in cash back attributable to travel spending, SunTrust Travel Rewards Credit Card earns unlimited 3% cash back on travel spending, including airfare, hotels, car rentals, cruises, rail, bus, taxi, and travel agencies. From the day you open your account, all other spending earns unlimited 1% cash back. Cash back can be redeemed for statement credits or direct deposits into the deposit account of your choosing, starting at a minimum redemption threshold of $5. You can also redeem for gift cards, travel, special experiences, and general merchandise. Cash back is always worth $0.01 per $1 spent at redemption, but non-cash items may have higher or lower redemption values. The easiest and lowest-friction way to redeem is for cash back. If you have a deposit account with SunTrust, you could qualify for a generous cash back bonus every time you redeem. To receive the bonus, you need to redeem via direct deposit into your SunTrust checking, savings, or money market accounts. Every 5 years, SunTrust Travel Rewards Credit Card users can claim statement credits up to $100 to offset the cost of Global Entry or TSA PreCheck applications. To qualify, the entry fee must be charged to the applicant’s SunTrust Travel Rewards Credit Card. The statement credit is applied even if the application is denied. This credit card has an $89 annual fee. However, the fee is waived on an annual basis for SunTrust Signature Advantage, Premier, and Private Wealth Management clients. There is no foreign transaction fee. Balance transfers cost the greater of $10 or 3% of the transferred amount. Cash advances cost the greater of $10 or 4%. Late and returned payments cost up to $38. The purchase and balance transfer APR is 0% for 15 months. Once the 0% APR introductory period ends, the purchase and balance transfer APR ranges between 12.49% and 22.49%. Your exact rate depends on prevailing interest rates and your personal creditworthiness. From the day you open your account, the cash advance APR is set at 26.24%. There is no penalty APR. Your online account dashboard includes a free FICO score that’s regularly updated. Your score is complemented by a host of informational content and tools designed to illuminate various aspects of the credit-building process and educate you on responsible credit card use. This card requires good to excellent credit. Minor blemishes may not be disqualifying, but serious problems in your recent credit history could impact your application. If you’re worried about qualifying, you can improve your credit with four simple steps. Excellent Bonuses for SunTrust Accountholders. If you’re a SunTrust deposit account holder, you can earn up to 75% extra when you redeem your accumulated cash back – turning $100 into $175. Realistically, most users won’t qualify for the 50% or 75% bonus tiers, but the 25% tier is within reach of many moderate-spending consumers. Think of it this way: a 25% cash back boost raises your return on travel spending to 3.75% and your return on all other spending to 1.25%. Many direct competitors, including the Capital One Venture Rewards Credit Card, don’t offer such bonuses. Flexible, Easily Attainable Sign-up Bonus. This card has a generous sign-up bonus: a $250 statement credit when you spend at least $3,000 in qualifying purchases within the first 3 months. That’s significantly higher than Citi ThankYou Preferred Card‘s sign-up bonus, which is worth approximately $150. High Cash Back Rate on Travel Purchases. This card earns unlimited 3% cash back on qualifying travel purchases. That’s better than the Chase Sapphire Preferred Card, which earns 2 points per $1 spent on travel (for a maximum return on spending of 2.5%). Long 0% APR Introductory Period. The SunTrust Travel Rewards Credit Card’s 0% APR introductory period lasts 15 months from the day you open your account and covers purchases and balance transfers. 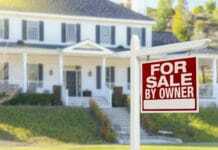 This makes it ideal for folks looking to finance large purchases and pay down high-interest debt. No Foreign Transaction Fee. The SunTrust Travel Rewards Credit Card has no foreign transaction fee. That’s great news for frequent international travelers. With the standard foreign transaction fee set at a frustratingly high 3%, it’s hard to make money from cash back or travel rewards. Great Fringe Benefits. As a World Elite Mastercard product, this card has a very nice lineup of fringe benefits. Among them: complimentary loss and damage coverage for rental cars charged in full to the card, extended warranties on certain items, price protection that essentially functions as a retroactive discounting mechanism, and reimbursement for lost or stolen items within 90 days of purchase. The Global Entry fee waiver is a nice perk too. Free Credit Score With Your Account. Your online account dashboard comes with a free FICO score and a host of helpful credit tools and content. If you’re hoping to learn more about building or rebuilding your credit, or keeping your credit record clean, this is a great little service. And it’s definitely better than paying $10 a month for a credit monitoring service. No Penalty APR. The SunTrust Travel Rewards Credit Card does not charge penalty interest. If you occasionally miss credit card payments through no fault of your own, this is a welcome relief that could save you hundreds of dollars per year. Has an Annual Fee. After the first year, the SunTrust Travel Rewards Credit Card has an $89 annual fee. Though the fee is waived for certain SunTrust account holders, most of the eligible accounts have associated maintenance fees, expenses, or commissions. 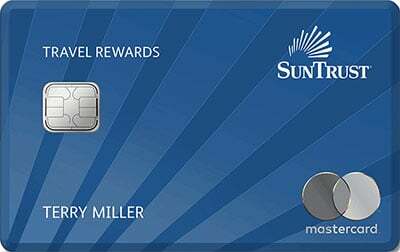 If you don’t have a waiver-eligible SunTrust account, you need to pay to keep this card in your wallet, and it’s therefore not suitable for occasional use. Low Baseline Cash Back Rate. This card has a low baseline cash back rate – just 1% on non-travel purchases. If you’re an occasional traveler, there are better cards available. Consider Barclaycard CashForward World Mastercard (unlimited 1.5% cash back) or the Citi Double Cash Card (unlimited 2% cash back). Few Travel-Specific Benefits. Other than the $100 statement credit for TSA PreCheck and Global Entry applications, this card has very few travel-specific benefits. Other popular travel rewards cards, including airline cards such as Gold Delta SkyMiles from American Express, offer travel perks like in-flight discounts and priority boarding. Relatively High Balance Transfer and Cash Back Fees. SunTrust Travel Rewards Credit Card has relatively high cash advance and balance transfer fees, which cuts into its appeal for those looking to transfer high-interest balances. If you live in the South, you probably live within easy driving distance of a SunTrust branch. In fact, there’s a good chance you know someone with a SunTrust account, and an even better chance you’ve heard of the bank at all. If you don’t live in the South and have no idea what SunTrust is, good news: you don’t have to be a SunTrust deposit account holder to apply for SunTrust Travel Rewards Credit Card. Of course, without a SunTrust deposit account, you’ll miss out on the potentially juicy cash back bonuses available to loyal customers. But there’s a way around that too: as long as you have a valid U.S. address and meet other basic criteria, you should be able to open an online account with SunTrust. Or, if you prefer, you can check out the bank’s full lineup of rewards credit cards. The SunTrust Travel Rewards Credit Card is ideal for frequent travelers who spend heavily enough to offset the $89 annual fee. SunTrust deposit accountholders make out especially well on the deal, thanks to potentially generous cash back bonuses and annual fee waivers for high-end accounts. On the other hand, this card isn’t appropriate for consumers seeking above-average returns on general spending, nor light spenders whose cash back earnings aren’t sufficient to offset the recurring fee. It’s also not ideal for travelers seeking generous add-on benefits such as airport lounge access, baggage fee waivers, and in-flight discounts. Key benefits include the cash back bonuses for SunTrust accountholders, the great sign-up bonus, 3% cash back rate on travel purchases, the long 0% APR introductory period, the nonexistent foreign transaction fee and penalty interest charges, the World Elite MasterCard fringe benefits, and the free FICO score. 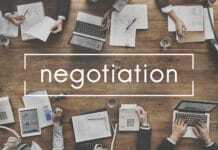 Drawbacks include the $89 annual fee after the first year, the low baseline cash back rate, few travel-specific benefits, and relatively high balance transfer and cash advance fees. Overall, SunTrust Travel Rewards Credit Card is a strong choice for frequent travelers who don’t care about add-on benefits like airport lounge access. Those seeking higher returns on general spending should look elsewhere.